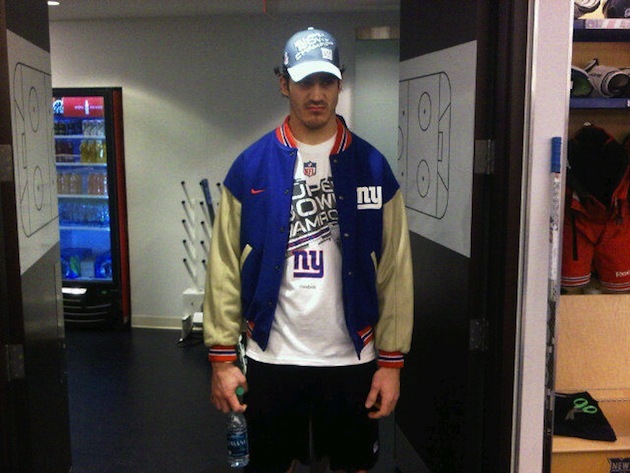 Those were the words of New York Rangers forward and Massachusetts native Brian Boyle to Chris Botta of the New York Times on Saturday, a day before the New England Patriots lost the Super Bowl to the New York Giants for the second time in four years. You really get a sense of the “I can’t [Gretzky]’ing believe Wes Welker didn’t make that catch” feeling in Boyle’s face. Marty Biron’s picture of Boyle didn’t quite capture the disgusted look that Prust’s did, but look on the bright side, Brian, maybe next year the Pats won’t run into the juggernaut that is the New York football Giants. Copyright (c) 2011 Yahoo!, Inc. All rights reserved.